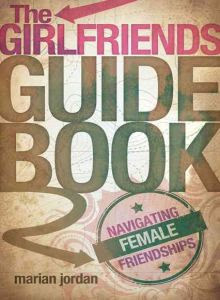 I'm plowing through my review titles these days and one in the stack was The Girlfriends Guidebook: Navigating Female Friendships . At first when I saw it, I snickered. Even when I read it I had to snicker at it. The front cover makes it look like it's marketed to teens. It wasn't written to young ladies (although they could benefit from the read) but to women in general, in all stages of life. I liked the premise for the same reason that my female readership likely would like the premise. It's the "how to" book for how to navigate friendships, and we've all had our struggles in this department. Females are hard to get along with and this we readily admit while being female ourselves. We don't make sense sometimes. We can be overly emotional. We can be mean, spiteful, bitter, jealous and we love, love, love to play comparison games to our extreme detriment. But the point is that we learn to stop doing that by the age of 10 and not 50. Before I go further, I just wanted to say that I shall speak in broad, general terms throughout the remainder of this post. I may make statements which reach a bit further than you are comfortable with or that you think are reasonable. This review, after all, is supposed to be about my opinion of the book. Please bear with me. Friendship is something of a lost art, I suppose. We're so busy with things that don't matter that we don't take time out to build meaningful relationships. We have long To Do lists which prevent us from spending much time with one another face-to-face. Our culture almost forces us to "go! go! go!" and in order to build relationships that last and that we care about, we have to force ourselves to stop running, slow down, and clear days off of the calendar in order to communicate effectively with each other. This quote above is what made me ultimately decide to review this book despite the fact that the author's "voice" got on my nerves and I think the cover art is cheesy and unappealing. Anyone who is willing to address the issues of backstabbing, gossiping and unwarranted drama (some drama is warranted) deserves a hearing in my opinion. Most problems in relationships and friendships arise out of a result of an improper use of words. We can be petty. We can act and react to one another in sinful ways. We should also absolutely pay attention to actions and motives as well -- but a lot of problems arise simply because we fail to think through the words that are coming out of our mouths. We fail to acknowledge that we have a sin problem in this area and we also fail to properly repent and apologize. If we did, not only might we make friends, we also have a greater chance of maintaining and deepening them. So that we would serve one another. We were not made to be alone, in general, and that God has made us to be a relational people. We need others and it's downright silly to think we can "go it alone." We are exposed to too much spiritual danger when we try to walk life's path all by our lonesome. I also agree that we learn best how to serve one another when we have close relationships. When the chips are down who among us doesn't want to call on our friends to come alongside of us to help us walk down painful paths and encourage us? We like to be served. But we also need to serve and when you are close to someone you know better how to do that in a very effective manner. Towards the end of the book she makes an argument that I think is worth sharing here because it is the best piece of advice I can think of as to how to treat a friend. She talks of Paul and Barnabas. We all have much to learn because we all have weaknesses in the way that we relate to others that need work. The danger enters into the relationship when one party or the other thinks that they've got it all together and it's the other person's fault why things are or have gone south for a very long winter. Finger pointing never saved a relationship. Being humble and gracious, loving and supportive, caring, trustworthy and loyal will take you oh so much further. I don't know where you are in your "real life" friendships but I'm going to go ahead and put this book out there for your consideration because I think it does serve a purpose in pointing out personal flaws while encouraging you to be a better friend. In fact, I'm particularly happy that in the Introduction Jordan tells her readers to read this book with their own self in mind. The Girlfriends Guidebook is not meant to be used as a finger pointing tool, but rather as a tool to examine your own heart and ways to see how you might improve your relationships. So, there you go! Let the self-examination begin! Thanks to PR by the Book for sending a copy of this book my way. This sounds like a good book for a mother and daughter to read through. From your review it sounds like it addresses some issues correctly and some incorrectly but it will start the topics well and be worth getting into. The tongue as weapon is a very serious issue that needs addressed. Friendship is not something that often comes my way but the friends I do have are the kind of people I can talk to about anything, listen to about everything and count on to have my back in prayer and when I say I will pray for them, I WILL. TRUTH is the main factor of friendship. But its a give and take truth of love, not the critical, degrading false-truth of breaking a person down with words so one feels better about ones own lack of self confidence. I've always loved the statement that" Friends are people that know your flaws and love you anyway." Friend is a dear sweet word to me, for the people God has brought into my life that have blessed me beyond measure and seen me through the darkest times. And here i am reading and typing again when I have a list as long as my arm today! But I do enjoy the stimulation in my brain that your book reviews inspire! Aha! Great! Another book I need to read. I need all the help I can get. I just told someone the other day that guys are just a lot easier to get along with. Maybe I'M the problem...hahaha! Hmmmm, have you read Dee Brestin's "The Friendships of Women"? I really liked that book--it was a true eye-opener for me and had some insightful Biblical commentary. And then a book I read recently (which one?? I can't remember, lol, but the point remains with me) alluded to a person sabotaging a friendship with too high of expectation--phew! That one hit home! So. . .the topic doesn't appeal to me right now, but maybe later! :) Thanks for a thought-provoking review. This topic really can be a struggle!!! I had a conversation on Friday with a friend about how there are some women I just connect with. We have a lot in common, conversation between us flows, and I come away from our times together feeling refreshed and joyful. But there are also women who, no matter how hard I try, I just can't connect with. It's not that there's anything wrong we just don't, well... connect. I guess that's ok. You can't be BFF with the whole world, right? I need to pick up this book. I struggle with friendships sometimes because I'm a demanding person (of myself as much as others, but it's still a problem.) and worry about asking too much of my friends. The logic that I would do the same for them isn't always useful as I probably put too much energy into people sometimes. I don't know. Basically I'll read the book!